Notes by the Friends of Dagnam Park fine art connoisseur. In case you are wondering Richard is the one with a name and a fancy hairdo, Mrs Richard has the blue frock and hands like a bunch of runner beans. Obviously, Gainsborough could not do hands, very good at frocks, frocking good in fact. But the hands do let him down, it is this problem that pushed him into the second tier of British artists, unlike Constable who did brilliant hands, albeit very very small ones, but at least they had thumbs. And just in case you are interested The Lady was called Frances. Frances Bristow was the daughter of John Bristow . She was born before 1746. 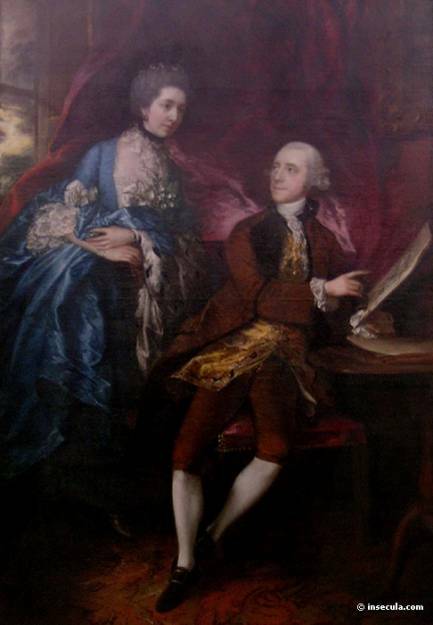 She married Sir Richard Neave , 1st Bt. on 16 February 1761. She died on 18 January 1830.